UPDATED: OCT 28, 2018 About 2.5 years past best before. Smells like cranberry orange sofa, clean palate, a touch herbal, sweetish finish. Kind of love. 2014 rating. Pours an insane amount of foamy bubbly white head and has a golden, slightly hazy appearance. Big thick dirty lacing. Aromas are mainly malty and hints of yeast. Flavours have some Belgian yeast notes, light malts, very fruity. Getting much more of the cranberries in the finish. Quite faint in the mix at the beginning. Tarty and full bodied mouthfeel. Pretty excessive carbonation. 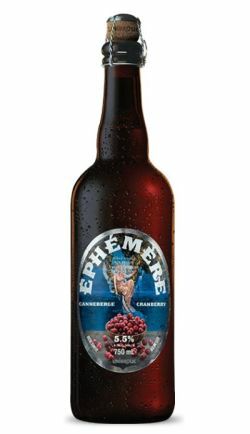 My last ephemere for the moment, the cranberry taste is too faint, yet it is well balanced. Lactic lemon and orange. Clear golden, thin head. Crabapple, lactic. Light body soft carbonation. Bottle pour into tulip glass from Cigarette City. Aroma is yeast, champagne, orange peel. Appearance is hazy golden yellow-orange with transient finger width white fizzy head, nice sparkle at edges of the glass, no lacing. Taste is orange, cranberry, berry over yeasty base. Palate is light bodied with thin, foamy texture, lively carbonation and mixture of sweet and tart berry/yeasty finish. Overall, a light, refreshing beer with subtle fruitiness rather than being bludgeoned over the head with it. Will definitely buy this again, digestible and even sessionable. From the 750 ml. corked, caged bottle with an expiration date of 07-25-2016. Cloudy yellow pour with a modest head that fades. The cranberry juice aroma is prominent with a fairly clean toasted Belgian malt, yeast, and spice character all underneath. The body is light to medium. The taste has a vibrant cranberry juice sweetness with a mild spiced finish. Not bad for what it is. Rating #1212 30.07.2014 On tap @revolutionyeg Pours a cloudy yellow with a decent white bubbly head that fades quickly to a ring. Has that wit/hefe kinda feel going in. Aroma is sweet (quite yeasty, cranberries). Taste is grainy, with a hint of cranberry on the tongue as well as a yeasty, creamy mouthfeel. Finish is quite crisp, and extremely refreshing.